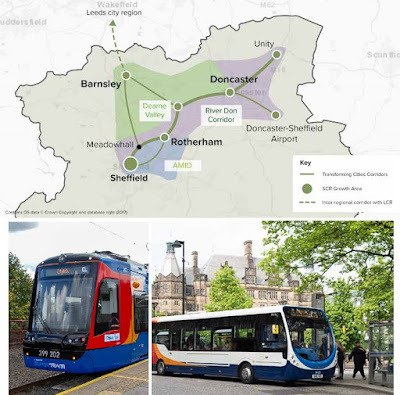 The Sheffield City Region (SCR) is one of ten areas in the UK to be shortlisted for a share of Government money to transform the way people travel. The remaining £840m looks set to be divided between the ten areas. Dan Jarvis, mayor of the Barnsley, Doncaster, Rotherham and Sheffield Combined Authority has previously stated that the bid was for £100m and has described the SCR as having an "antiquated transport system that is chronically short of investment and that doesn’t move the residents or businesses around the region as it should." Jarvis said: "I welcome this announcement from the Government, which reflects the strength of our bid to the Transforming Cities Fund. "It is critical that we improve the transport system in our region, to create better access to major employment sites, reduce congestion and better integrate different modes of transport. "I now look forward to working with the Department for Transport as we develop our detailed plans." An initial £50,000 is being provided as well as bespoke support from government to co-develop the strongest cases for investment. A transport strategy is being drafted and the SCR is pushing for a new mass transit system to support growth. If secured, the funding would pay for transformational transport changes in these areas, including bus priority improvements, enabling active travel, providing transport hubs, introducing smart ticketing, new park and ride sites, and much more. This would lead to quicker journey times, reduced congestion, improved punctuality and reliability, and benefits associated with active travel, such as improved health and wellbeing. Cllr. Chris Read, leader of Rotherham Council, said: "Rotherham's ambition is to create the right conditions for growth and regeneration. "As Yorkshire's fastest growing-city economy, and UK's tenth fastest growing economy, we are working closely with our neighbours to ensure a strong transport, digital and environmental infrastructure supports further economic growth for the region." I think Dan Jarvis is managing to be very polite about the disconnect between the funding needs, for road improvements, of the SCR and what £ might be available. When we see what has been spent(by governments of both colours)in the flat South East, the comparative pittance spent in the North - that has the much more difficult landscape for road improvements, is a disgrace.